Visit Dubai and explore the open air markets with AESU! Dubai is known for its modern, larger-than-life appeal. Home to the world’s most luxurious hotel and the largest shopping mall, the City of Gold attracts its fair share of wealth. Exploring the bustling downtown area can be overwhelming, but time seems to stop when you enter the Deira district near the Dubai Creek. The city sounds fade into the distance, and the scent of flower petals and herbs fill the air. Discover the souks in Old Dubai with AESU! The markets, referred to as souks, are located on the winding, narrow streets of Dubai. Vendors stand by their stalls, eager to discuss their products with interested shoppers. The Spice Souk in Deira is one of the most famous markets in the city! The stalls are filled with every herb and spice under the Middle Eastern sun, with fresh stocks arriving each day. Visitors can spend the entire day exploring the collection of colors and unique scents. The rising number of supermarkets has decreased the demand for spice souks, but the best local chefs swear by the quality and authenticity of the market herbs. 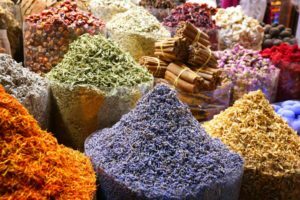 Herbs and spices make wonderful souvenirs, but remember to negotiate the price! Dubai’s Gold Souk is considered the heart of the city’s trade economy. Gold, silver, and more sparkles on display for locals and tourists to enjoy. The jewels are customizable, and buyers can purchase raw materials (raw pearls, diamonds, etc.) to be made to their liking. If you prefer the touch of silk to the sparkle of diamonds, explore the Textile Souk found just across the Dubai Creek. Talk to local designers, try on unique outfits, and peruse the endless collection of buttons, stones, lace, and accessories! Visitors can get to the Deira souks by metro, but it’s better to arrive by an abra. An abra is a traditional wooden boat used to ferry locals and tourists across the creek. It only costs one Dirham to ride, but it offers the best view of Old Dubai! Riding on an abra is not only beautiful, but it’s a great way to avoid the early evening traffic! Sit back, enjoy the waterfront views, and take a selfie or two before arriving at your destination. This entry was posted on Wednesday, January 16th, 2019	at 10:15 am	. You can follow any responses to this entry through the RSS 2.0	feed. You can leave a response, or trackback from your own site.